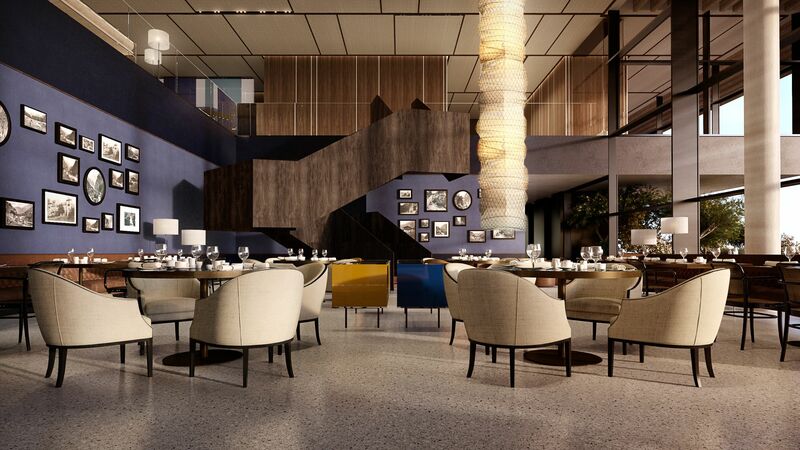 Opening in 2019, The Grand Park Hotel Rovinj is just a 15 minute walk from the centre of Rovinj, on the sparkling Adriatic coastline of Croatia. It’s a modern hotel surrounded by a park and offering guests breath taking views of the coast, the town of Rovinj and its harbour. Spend your days relaxing on the sun terrace before taking a cooling dip in one of the hotel’s three swimming pools or immersing yourself in the tranquillity of the spa. Families are well catered for, with a Kids’ Club and activity programme providing fun and games throughout the day. Older children can make the most of the many water sports, as well as tennis and bike rental. When it comes to dining, watch chefs create unique dishes at the Cap Aureo Signature Restaurant, dine on the terrace and take in views of the sea as you try lobster and other fresh fish, or enjoy freshly made pastries. Enjoy views of Rovinj old town and marina from this fifth floor restaurant. Watch the chef create delicious dishes from the open kitchen. This extensive bar has a private cigar lounge and beautiful terrace where you can choose from delicate wines, exotic cocktails, the largest selection of champagne in Croatia and a seafood bar selling fresh local creations. Choose from healthy snacks, light bites and Mediterranean summer dishes as you overlook the pool. The bar also serves fresh smoothies, juices and cocktails. Dine on the large terrace and enjoy delicious succulent meats grilled at the open cooking station. The wine cave features a variety of bottles and is ideal for wine tasting, while you can also enjoy a varied deli platter, including breads, cold cuts and cheeses. Choose from Italian coffees, creamy ice creams and homemade pastries washed down with cocktails and aperitifs. Guests can also enjoy salads, sandwiches and other light meals. 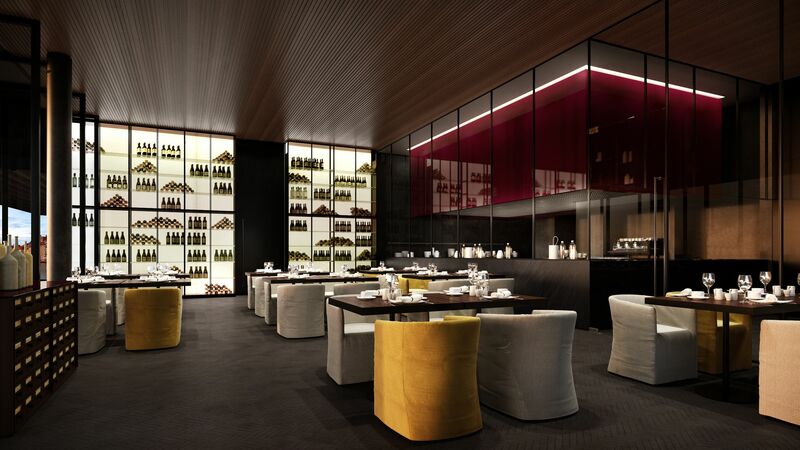 This modern, elegant restaurant serves an extensive buffet breakfast and relaxed dinners. Choose from international and Mediterranean dishes, as well as a wine and cocktail menu. 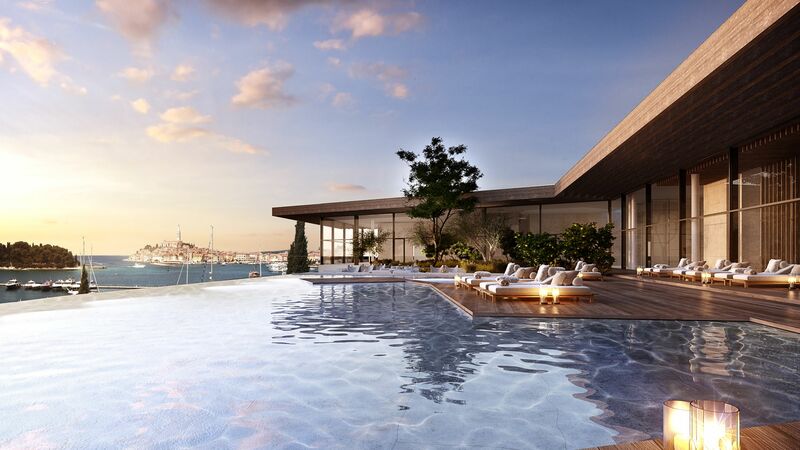 The sports pool stretches between a chic indoor area and elegant outdoor terrace and offers beautiful views of Rovinj. There is also an infinity leisure pool and a relaxation pool, each surrounded by loungers and a sun terrace. Pebbly Mulini Beach is located just 50m from the hotel and is home to loungers, beach service, a beach club and cocktail bar. Guests can also enjoy water sports from the beach. The children’s club is ideal for little ones wanting to make new friends and try some fun and games throughout the day. The activities programme includes face painting, magic shows, mini discos, treasure hunts and more. 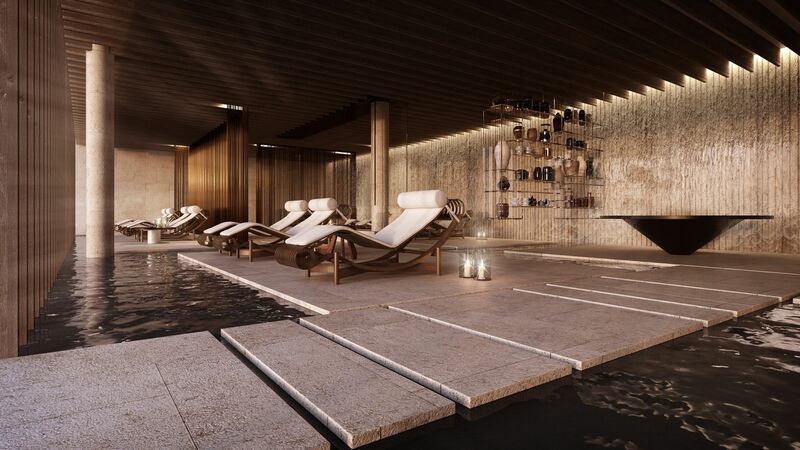 The extensive hotel spa is home to a relaxation pool, sauna, couples’ therapy room, plunge pool, ice fountain, tea room, experience showers and a wellness and pool bar. Guests can choose from massages, facials, wraps and more during their stay. The gym has a selection of machines so you can work on your cardio and strength training on holiday. Mulini Beach offers stand up paddle boarding and kayaking, ideal for guests wanting to take in the views of the Adriatic Coast and surrounding area. The hotel has eight outdoor courts and four indoor courts. Guests can book private and group lessons or just play with a partner. Rent bicycles from the Grand Park Hotel Rovinj and explore the town of Rovinj, which is just 5 minutes away. Guests can also walk along the Lungomare promenade. Private and group yoga lessons are held in the tranquil spa or in the hotel’s private gardens. Grand Park Hotel Rovinj is a 15 minute walk from the centre of Rovinj, where you can enjoy spectacular architecture, delicious local wines and seafood and beautiful views from the church in the centre of the town. It’s located on the Adriatic Coast and is surrounded by the Golden Cape Park Forest, ideal for nature lovers. Explorers will enjoy visiting the nearby islands by boat, as well as sailing, horse riding and cycling through the surrounding landscapes. Zagreb, Croatia’ capital, is just two and a half hours’ drive away and is home to shops, bars, restaurants, cafés and a thriving cultural scene. Grand Park Hotel Rovinj is 40 minutes by car from Pula Airport. The chic, modern rooms have large windows with beautiful views of the park which surrounds the hotel. There is a bedroom with a double bed or twin beds, a furnished terrace and a seating area for four people. Guests can also enjoy air conditioning, a smart TV, safe, Minibar and free Wifi. The en suite bathroom contains a bathtub, walk in shower and a double sink. These modern, elegant rooms have large windows offering views of the sea, town and marina. There is a bedroom with a double bed or connected twin beds, a furnished balcony and a seating area for four people. The rooms also have air conditioning, a smart TV, safe, Minibar and free Wifi. The en suite bathroom offers a bathtub, walk in shower and a double sink. These spacious rooms have large windows with sea views, a bedroom with a double bed or connected twin beds, a seating area with space for four, plus, a private plunge pool in front of the balcony. There is also air conditioning, a smart TV, safe, Minibar and free Wifi. The en suite bathroom has a bathtub, walk in shower and a double sink. These large suites are ideal for families, with two bedrooms, one with a king size bed and the other with twin beds. Enjoy two furnished balconies and large windows with views of the park, as well as a seating area for four. There is also air conditioning, a smart TV, safe, Minibar and free Wifi. The suite offers two bathrooms with bathtubs, walk in showers and double sinks. Save up to 15% discount on the hotel price for minimum stays of 3 nights for holidays between 12 April - 02 November 2019 booked 60 days prior to arrival.